Florence Ifeoluwa Otedola popularly known as DJ Cuppy, released a new single last weekend titled ‘Werk’ as she teams up with Skuki. 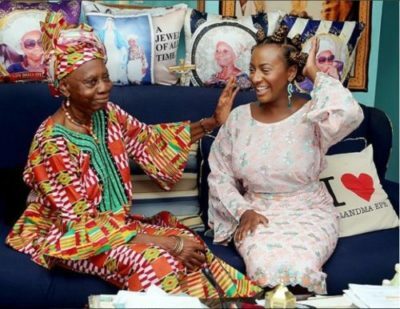 DJ Cuppy went to her hometown Epe to greet her Grandma and Former First Lady of Lagos State, Lady Doja Otedola. Cuppy went the traditional way which shows she is from a well cultured yoruba family as she wears her ‘Buba ati Iro’ (Blouse and wrapper) with her well plaited indigenous hairstyle. While at Epe, Cuppy went to meet Afrinero band to performance her new single with skuki ‘Werk’ Live. She seems to enjoy herself as she sings in accordance with the instrumentalists/band.